Check out some photos of our new house! These pictures were taken on May 19th, when the engineer came to inspect the house. All indoor photographs were taken with a wide-angle lens, so the proportions aren't accurate. Newer photos from January and December are available. The newest photos are on this page (May 2000). All photographs on this page (and all of the other pages except where indicated) are Copyright © 1999, Christopher Swingley. Each of the eleven photographs are about 25 K, so the page will load very slowly over a modem link. This picture shows the house and yard taken from the end of the driveway. This side of the house faces west, and has windows into the downstairs office and living room on the first floor, and a window into the master bedroom on the second floor. The deck is also visible extending around this side of the house. The doorway next to the garage door is the main door to the house. It leads into the garage, where a second door leads into the house. This is the yard taken from about halfway up the driveway. 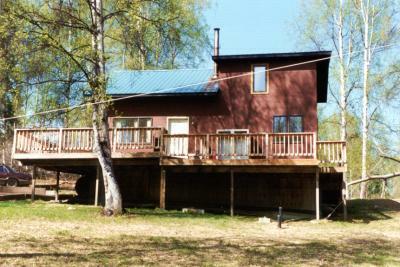 The deck and corner of the house is visible on the left. The property extends beyond what is visible in this picture. 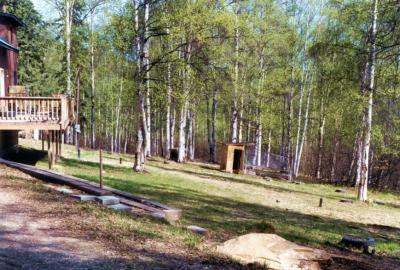 The object in the center is a chicken coop. 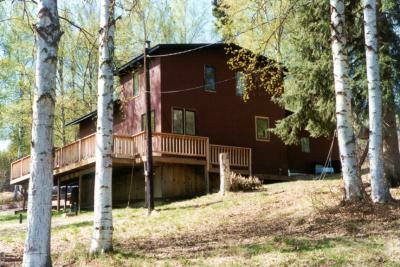 This shows the back of the house. The driveway is on the left. This side of the house faces south. 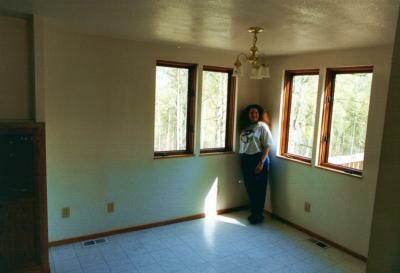 The first window on the left looks into the living room, and the window on the right looks into the dining room. The door next to the living room window provides access to the deck from the living room. Next to that is an old dual freezer that no longer has any doors on it (and probably doesn't work either!). The single window on the second floor looks into the only bedroom on the south side of the house. Underneath the deck is an enclosed crawlspace that provides access to the duct work, water system and fuel. This is the house from the east side. The windows on the first floor look into the dining room and kitchen (from left to right). The second story windows look into the two bedrooms nearest to the stairs. In case it isn't clear from these exterior photographs, the siding on the house is painted plywood. Entering the house from the garage leads into a small entryway that contains a washer and dryer. Opposite the entry door is the bathroom for the first floor. When entering the kitchen is on the left. 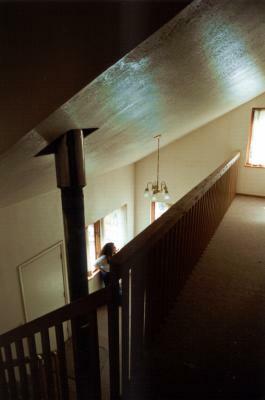 This photograph was taken from the dining room, so a visitor would appear in the back of this photograph near the stove. This is also where you would go if you wanted to use the bathroom. This shows the dining room. The kitchen is on the left, and behind me is the living room. Through the window on the right you can see the railing of the deck. This picture shows the living room. 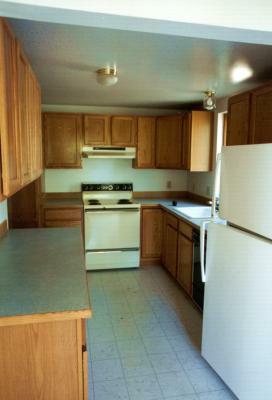 The dining room (and kitchen) are straight ahead past the open door next to the wood stove. This door leads to a closet under the stairs. The other opening on the first floor leads to a first floor office or bedroom. 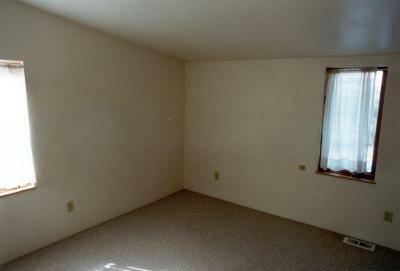 The furnace, water pump, and hot water heater are in a closet in this bedroom. Behind me are the two windows (on the south and west facing walls of the room) you could see from the outside. The doorway to the deck is on my right at the foot of the stairs. On the second floor you can see the door to the master bedroom (on the left), the door to the bathroom, and right next to it is the door to one of the other upstairs bedrooms. 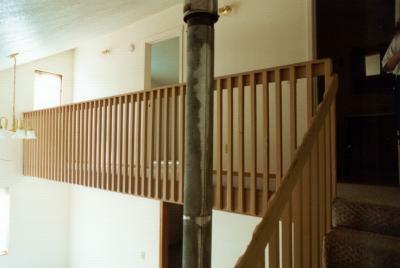 This picture is taken from the stairs to the second floor. From here you can see a window at the end of the balcony and the doorway to the master bedroom (on the left) and the bathroom (at the top of the stairs). 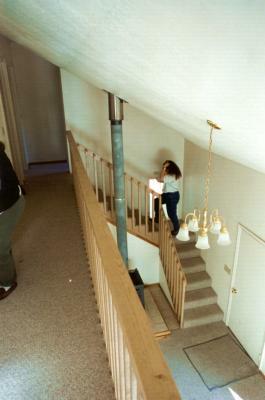 This picture was taken at the top of the stairs, looking down toward the living room. From here you can see the door to the deck, the two windows into the living room, and the window at the end of the balcony. This picture was taken at the end of the balcony. 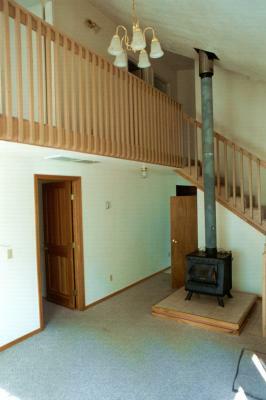 At the other end of the hallway you can see a doorway on the left and on the right, leading to two of the three bedrooms on the second floor. The woman on the left (our realtor) is standing in the doorway of the master bedroom. This shows a bit of the master bedroom. 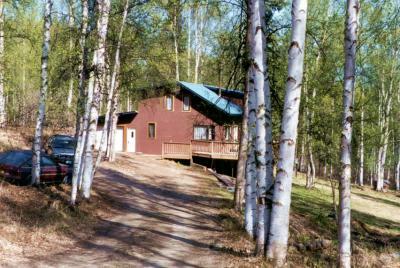 The window on the left looks west (over the driveway) and the window on the right looks north to the front of the property and Whistling Swan road.